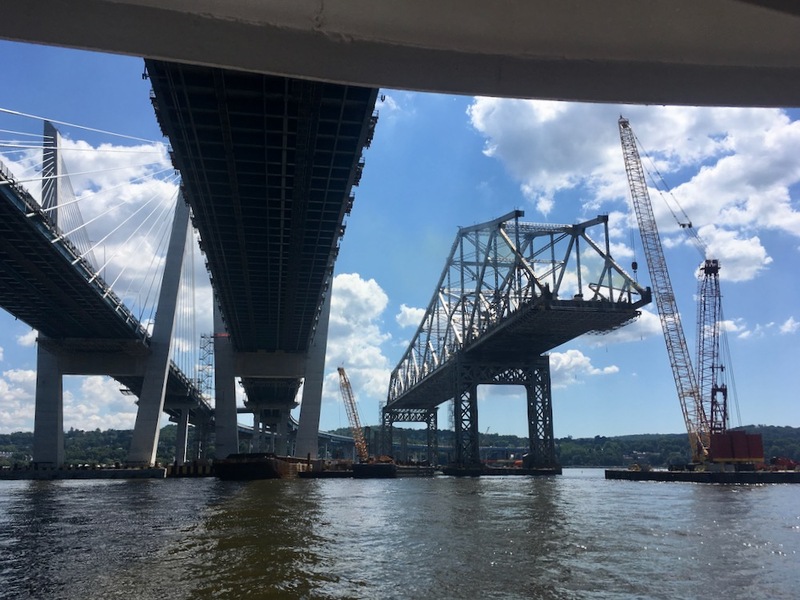 The Tappan Zee Bridge has been in the news lately, in part due to the politics surrounding the construction and naming of its long overdue replacement. Having lived nearby and utilized the bridge on an almost daily basis for close to twenty years, I feel like the span and the water around it are my home field. 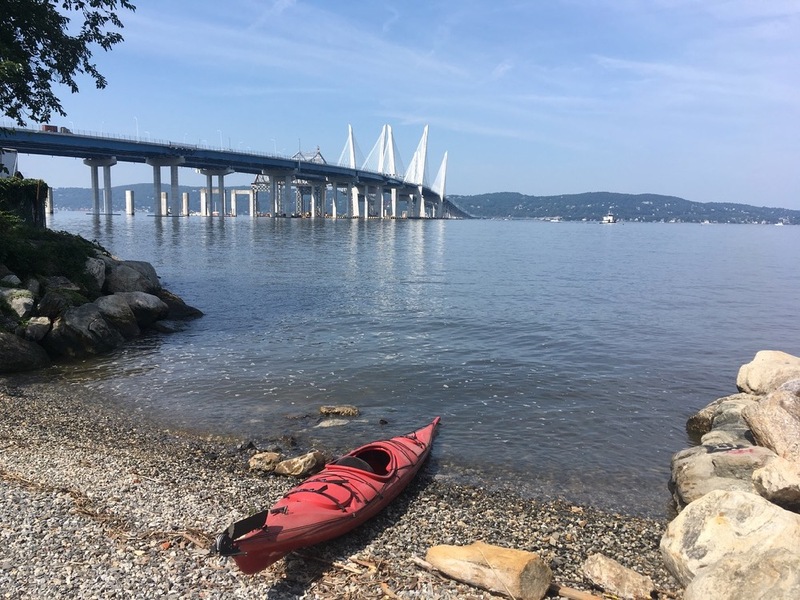 Many people don’t know that the name Tappan Zee actually refers not just to the bridge but to that section of the Hudson in Westchester and Rockland County that surrounds the structure where it crosses the river. 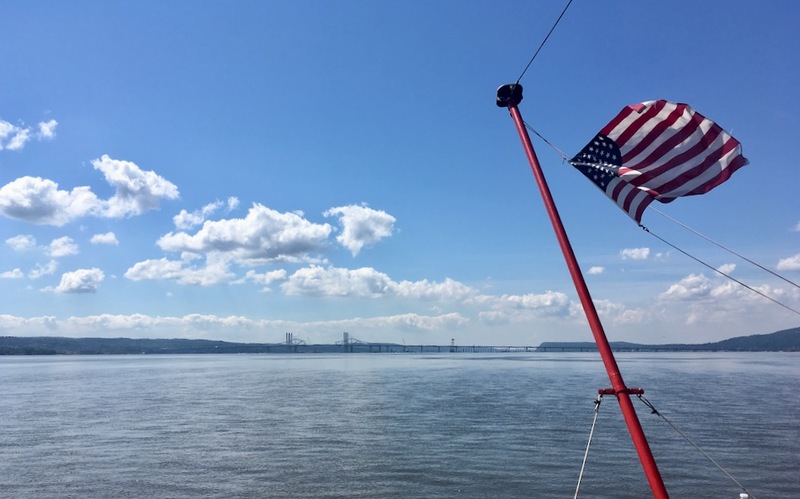 “Zee” is a Dutch word that means “sea” and “Tappan” refers to the area’s original residents, a sub-group of the Lenape tribe. The Zee is a wide spot that stretches from roughly the New Jersey state line up to the Peekskill area. Though we call it a river it’s actually a saltwater estuary. Depending on the tides and wind, it can be a very calm, forgiving paddling environment or a confusing, frustrating combination of strong tidal currents and wind chop pushing you in different directions. At times you feel like you’re paddling in oatmeal. Along the Zee on both sides, there are several convenient spots to launch a kayak and many nooks and crannies to explore. Most of the time I put in either in Piermont Marsh or from Nyack beach, on the Rockland side. Recently I had an opportunity to get a more up-close look at the bridges, both the new one and what remains of the original. 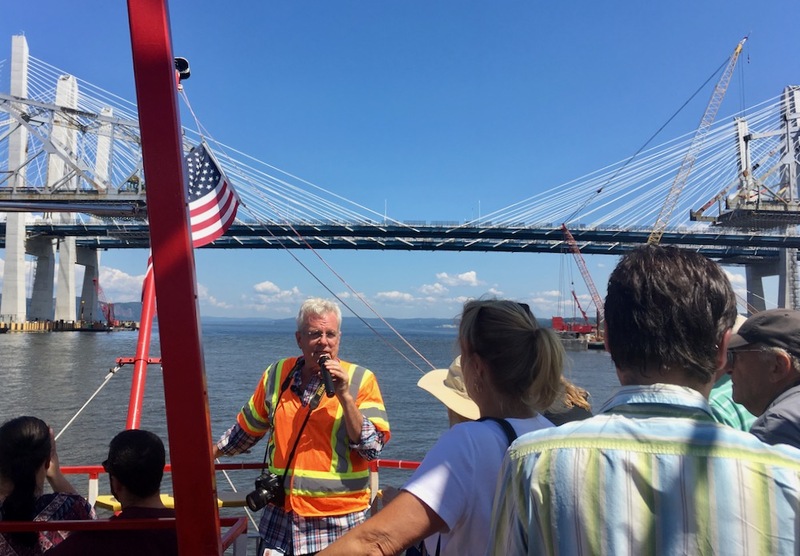 I went with a close relative on — “The Tappan Zee Bridge Experience, Past, Present and Future” — a tour of the area on the River Rose, a stern-wheel party boat based in Newburgh. We arrived, I thought, early but found that we were more or less last in line to get on the boat at the marina in Haverstraw. The demographic for Historical Society boat tours is what you might expect and they lived up to the early-riser stereotype. Including myself and a few other outliers, I’d put the average age of the crowd somewhere close to eighty. The boat ride actually wasn’t actually all that bad. A historian and a guy from the company building the new bridge took turns providing commentary over the P.A. as the trip proceeded. There were all the expected lame jokes of course including references to the “three hour tour.” The crowd let out a predictable, collective groan when they got to the part about the span’s new name. But there were also some tidbits of interesting local history. Even the roast beef sandwich in the included bag lunch was pretty good. When we got to the bridge, it was pretty neat to get a close up look at everything from the upper deck. 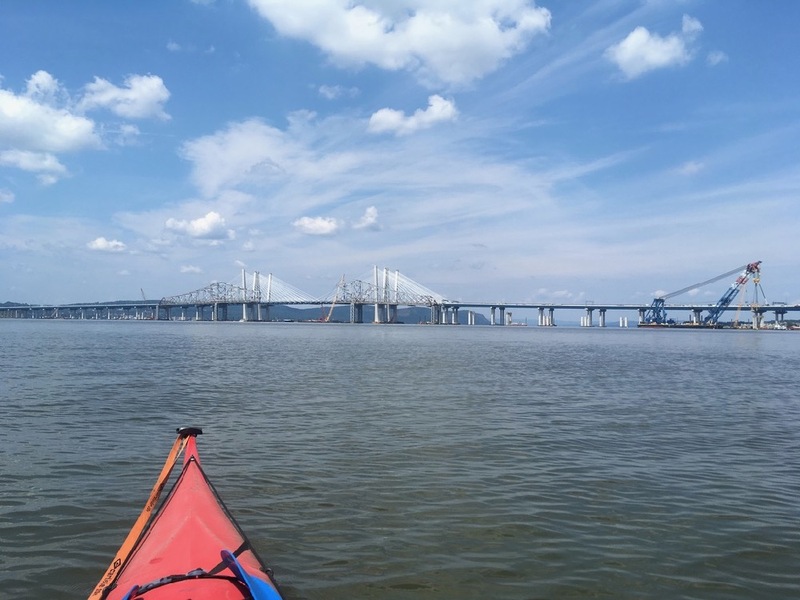 A couple weeks later, I decided to mix up my paddling routine and launch from Tarrytown rather then one of my usual spots. 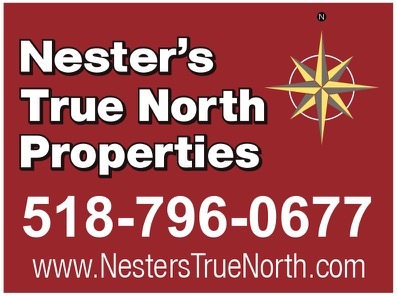 It would be a little change of pace and a chance to see the construction zone from a different perspective. Just to be sure I didn’t stray into a prohibited area, I looked online the night before and printed myself a map of where I was allowed to be and not allowed to be and stuck it in plastic inside my deck bag. 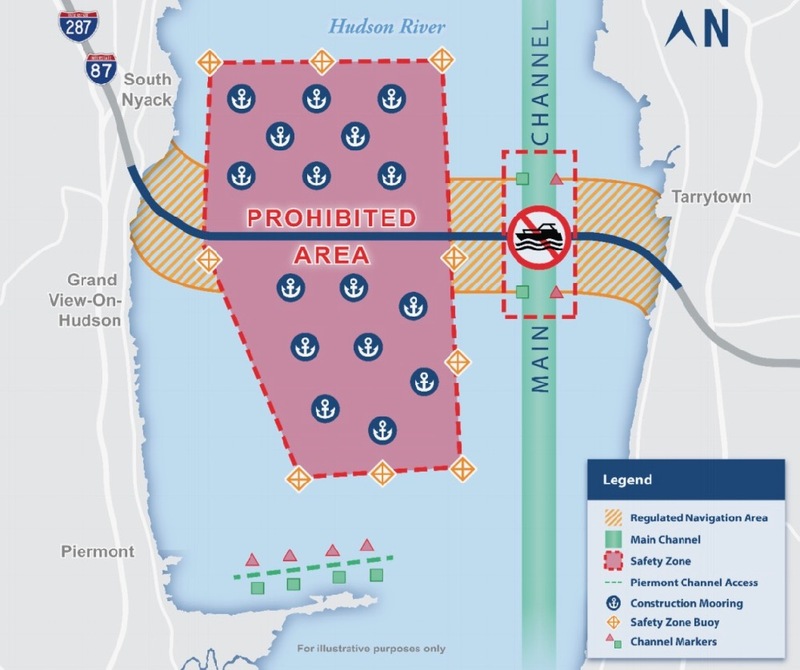 I put into the Hudson from a park in between the Tarrytown train station and the marinas near where the GM plant used to be. I started out going north, away from the bridge. I found the usual precious Hudson Valley stuff you would expect including a lighthouse, some nice homes, another park and a swim club. I still have a hard time accepting that people swim in the Hudson (or eat fish from it) but there it was. After a half hour of paddling I turned around and let the tide push me back to the south where I paddled past my launching point and down to the bridge itself. I was careful to stay out of the way of the tug boats and construction barges. The bridge was what I expected. From the water, it makes you feel very small as you paddle beneath it. The floating cranes also were impressive when viewed from the water. I paddled south along the eastern shore towards Irvington and Hastings, knowing that the tides would make my return trip more difficult. By the time I got my kayak out of the water and back up on my truck my arm muscles were spent. Now that both sides of the bridge are open, it’s a big improvement. I’m sure most of my fellow commuters are as happy as I am that the finish line for this project is finally in sight. As far as all that other stuff, it’s going to always be the Tappan Zee to me. Excellent article and pix, Brownski, especially the part about your sister’s emergency evacuation plan. People from outside the U.S. have no idea how dilapidated our infrastructure is, especially in and around big cities in the northeast. This is inspiring to me. Our government uses it’s vast resources to anticipate and solve a major problem before it explodes. It’s a beautiful piece of crucial infrastructure. 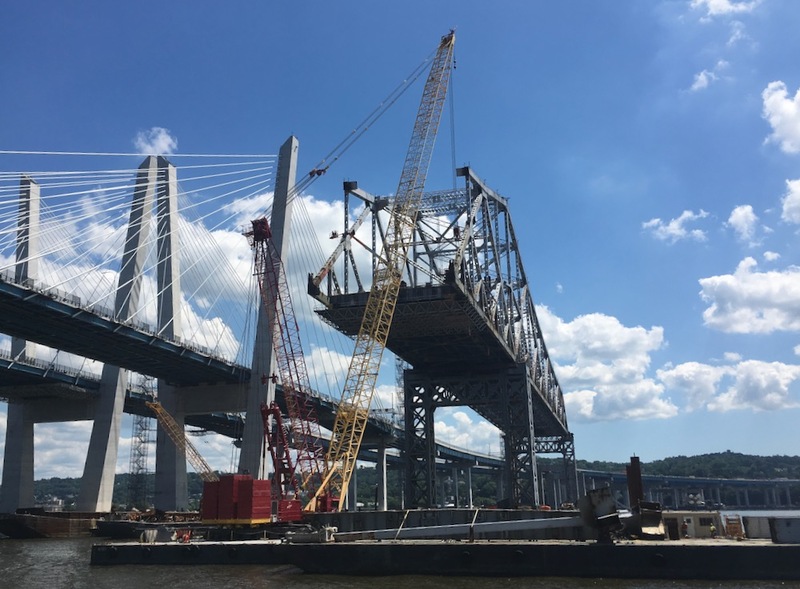 Three cheers for the new Tappan Zee Bridge. Cheers to you too Brownski, you have adventure in your soul. I was also on that Historical Society Tour. Really enjoyed the up-close views of the bridges. A nice report. Well written. And it’s the Tappan Zee Bridge. Nice article brings back memories. My dad kept a small sailboat at the Haverstraw marina and we sailed under the old bridge many times.